Bali Spa Kupu Kupu Barong Jimbran was just opened on April 2011, and Bamboo Spa by L'OCCITANE is located on the new hotel. L'OCCITANE is the long established high qualified French cosmetic brand for 30 years which use natural products for perfume, skincare, and body care products, etc. Bamboo Spa was offered by L'OCCITANE and it is the second produced spa after Mango Tree Spa in Ubud. Reserving Bamboo Spa’s menus with special discount prices requires a payment made via our Japanese bank deposit transfer in 7 days advance. This is the special original package of Bamboo Spa, Vervana Bamboo Package with L'OCCITANE’s「Vervana 」and the「bamboo」in Bali.Vervana is the herb with fresh flagrance as lemon and orange and it has good effect for deep sleep and relaxing. It is also called as “the fragrance of fall in love” because witches use the herb for medicine of love. Bamboo Spa offers 4 kinds of special treatment used Vervena and Bamboo. 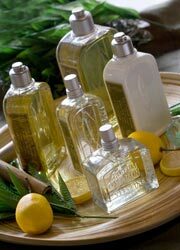 Why don’t you try the magic of L'OCCITANE with fragrance of Vervena? This Fusion Therapy is a specialized massage using traditional Balinese bamboo to stimulate the flow of energy within the body. Varying length of bamboo are applied to the body using rolling techniques and long deep strokes that target tense muscles and provide therapeutic to sore and stressed joints. As a first step, the whole body will be thoroughly exfoliated with the Citrus Bamboo polish, deeply exfoliate the dead cells, and effectively prepare skin for further treatment. 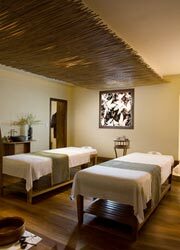 Verbena Bamboo Fusion Massage has a therapeutic effect on the body, the special sequence provide our body and mind to state of deep relaxation. This luxurious body treatment using traditional bamboo stimulates the flow of energy to rid the body of to toxins and stress. This Shea ultra-moisturizing treatment begins with a Shea Nourishing Scrub containing 5% of Shea butter plus walnut shell powder to gently remove dead cells and smooth the skin. As aresult, your body is left satin-soft...like entirely renewed! The treatment with almond that revitalizes and makes soft skin. Apply Delicious Scrub that contains crushed almond seeds and sugar by whipped with almond oil and almond butter to remove horny substance and make healthy smooth skin. After that, apply slimming massage with Almond Supple Skin Oil to detoxify body wastes by massage along with lymph circulation on stomach, hip, and tights that are the part particularly to have cellulite and fat easily. Enjoy 60 minutes of relaxing Aromachologie body massage based on Swedish effleurages, Chinese acupressure points and long kneading Balinese movements. Afterward, L'OCCITANE customized 75 minutes complete facial will leave your skin glowing with youth and radiance. A couple's delight! Therapists will analyze your slin type and recommend the most suitable facial line to meet your needs. As a result, your skin is left more comfortable and radiant. This deeply stimulating ancient Indian ritual is an enlightening and transformative experience. It begins with a hair and scalp massage using our authentic medicinal oil based onL'OCCITANE Oil. Next you will experience a slow pouring of warm oil onto the forehead, which stimulates the third eye or the sixth chakra, the window to the soul. Swedish effleurages and Shiatsu pressure points are associated to the deep & penetrating warmth of natural basait stones. The stones are placed on the 7 Chakras- traditionally know as the body's key energetic points- to improve the flow of energies and help rebalance & mind. It starts with a 60 minites Aromachologie relaxing massage to stimilate cueculation and remove stress,followed by Ayurvedic shirodara including hair and scalp massage and 30minutes shanty oil pouring onto the third eye through scalp. This Relaing Body Massage is beased on Swedish Effleurages, combined with Chinese Acupressure points and long, kneading Balinese movements. Our specific Aromachologie massage oil blends pure essential oils of Lavender, Tea tree and Geranium, traditionally known for their relaxing properities, to enhance the treatment benefits and release all tensions: stress just fades away! This Massage is a variation of our Relaxing Body Massage combines Hawaiian Lomi Lomi with Acupressure and gentle stretching movements, thus allowing working deeply into the muscles with flowing strokes, totally nurturing and relaxing the body. For enhanced benefits, the whole sequence is performed with our specific Aromachologie Relaxing Massage Oil. As a result, tensions and strained muscles are released; your whole body feels refreshed and deeply rebalanced. The exclusive massage specially designed for the moms-to-be delivers enhanced relaxation and well-being. The massage is based on the gentle effleurage movements of Swedish and Balinese techniques, associated with a nourishing formula, enriched in grape and apricot seed oils to gently accompany the changes linked to maternity. Our unique body brushing deeply softens and invirorates the body.This smoothing massage performed all over the body with our signature brushes effectively removes dead cells, rough patches ant imprities, and stimulates micri-circulation. Calming benefits of Lavender are fused with a blend of traditional massage techniques- Balinese, Swedish, and Chinese. They all come together to comfort the body and bring calm and tranquility to the mind. This exclusive massage features all of our signatures to best target individual needs: Relaxing light strokes and deep tissue pressure focused especially on the back area release stress and muscular tension, while revitalizing strokes and hot stones combat tiredness, enhance toxin elimination and boost energy. ­This facial effectively addresses the visible signs of aging: wrinkles, skin slackening and lack of smoothness It is based on our signature lifting and firming massage sequence, which together with activation of specific acupressure points, will stimulate micro-circulation and relax the muscular tensions that cause fine lines. This advanced brightening facial is ideal for anyone concerned about sun damages and age spots. It effectively jights pigmentation marks, thanks to specific formulas enriched in derivative of Vitamin C,with adual action on skin dicoloration - both corrective and preventive. At the same time, organic Immortelle essential oil,combined with our signature lifting face massage, delivers strong smoothing and firming benefits. As a result, slin is left incredibly smooth and radiant; complexion looks brighterand more even then ever. Use the most beautiful flower that stop the time on the best moment, “Immortelle” the best product, Divine Cream. It is the luxury cream of the comprehensive product of L’OCCITANE Skin Care; including micro capsule Immortelle for making fresh skin and Myrtole essential oil for improving to strain skin. Applying deep lymph drainage and lift up massage to décolleté and whole face, and providing intensive action to visibly firm the skin and ensuring the skin retains its youthful properties for a longer period of time. This facial addresses anyone concerned by dehydration and lack of softness, either due to skin nature or to external aggressions (sun, cold weather, wind...). Shea Butter has the ability to compensate for lipid deficiency in eqidermal cells and restore skin balance. Combined with our signature drainage massage sequence that enhances the ingredient's effectiveness by boosting microcirculation, its repairing and hydrating properties will bring comfort and nutrition to skin. As a result, skin is left deeply moisturized and nourished and discovers a new feeling of comfort. Happy Legs starts with a full leg and feet exfoliation, using 2 different Shea formulas, to specifically target each area's needs. Then, complete leg masage will be performed, associating our Aromachologie Gel-Cream for tired legs, enriched with essential oils of cypress and camphor, with Lymphatic Drainage technique, to re-activate microcirculation and help reduce wxcess fluid atorage. To finish, feet will be massaged with Shea Foot Cream, formulated with 15% of nourishing and repairing Shea Butter. As a result, feet are left soft and smooth, and legs feel lighter and revitalized. Children age over 12 can take spa treatment. Children under 12 need agreement with parents. After booked canceration should be charge 100% cancel fee. I always use the L’Occitane shampoo. I love its aroma very much, and I never thought that I could enjoy L’Occitane spa in Bali. It was a moment that I can really relax.